The United Kingdom along with other countries would continue to put pressure on Myanmar so that condition is created for early repatriation of the Rohingya people. Visiting UK Secretary for International Development Penny Mordaunt, MP, said this when she called on Prime Minister Sheikh Hasina at her official Ganabhaban residence here this evening. After the meeting, PM's Press Secretary Ihsanul Karim briefed reporters. 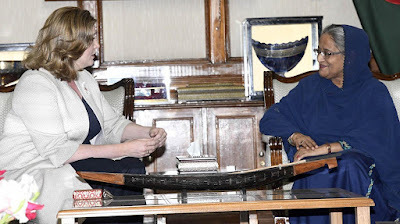 The UK minister said her country fully endorses Prime Minister Sheikh Hasina's five-point proposal that she placed in the last UN General Assembly for solution to the protracted Rohingya crisis. She highly appreciated Bangladesh's humanitarian gesture by sheltering tens of thousands of Rohingya people. The press secretary said the rehabilitation and repatriation of the Rohingya people also came up for discussion. At the meeting, Prime Minister Sheikh Hasina said Bangladesh has given shelter to the Rohingya people on the humanitarian grounds. She, however said, it would not be possible for Bangladesh to keep them here for a long time. Sheikh Hasina expressed satisfaction as the Myanmar government has agreed to take back their nationals from Bangladesh. Pointing out the MoU signed between Bangladesh and Myanmar in this regard, she said a joint working group would be formed to deal with the repatriation of the Myanmar nationals from Bangladesh. Recalling the Chittagong Hill Tracts (CHT) peace accord, the prime minister said the decades-long insurgency problem in the CHT was solved peacefully without any third-party involvement. Sheikh Hasina said the government is issuing identity cards to the Rohingyas with their Myanmar address. PM's International Affairs Adviser Dr Gowher Rizvi and PMO Secretary Suraiya Begum were present on the occasion.